Another month and I’ll be writing Arlo’s one year update, doesn’t time fly!? This month has been overshadowed by illness in the first part of the month with Arlo getting a v&d bug lasting almost a week! It was miserable for him (and me) and he became a clingier than normal constantly breastfeeding baby. Almost like reverting to being a newborn again! Attempting to get him to sit still and hold his 11 month card just wasn’t happening, I’ve got a lot of blurry photos of him and the card is now half chewed. Thankfully once the bug disappeared he had a couple of nights and days of pretty good sleep as he caught up on all he’d missed but generally he’s still be sleeping ‘badly’ aka waking up multiple times a night for feeds and only one nap a day. I try and get him to have another one if possible but it’s so hard as he needs to be fed to sleep and with Athena at home I obviously can’t leave her to her own devices whilst we go and nap together! A couple of friends had mentioned that their babies seem to have a big leap in ability after an illness and I’d definitely agree. Arlo suddenly learnt to clap after weeks of me trying to teach him and has also FINALLY gained an appetite for food! He’s still not standing on his own for more than a second or two so I’m hoping walking is a little way off yet because that’s when life will get crazy! It’s bad enough that he’s so tall as he can reach things on the dining table when he pulls himself up! No more teeth this month so he still has eight. He’s still fairly vocal but no real discernible words really, but he knows what things are (ball, toys, sister, door, drink etc) and will go to them or wave at them. In terms of favourite games and activities his number one favourite thing to do is follow me around wailing at me to be picked up, and flinging himself at the floor in a very dramatic fashion. Second is climbing onto the edge of the sofa and pulling at the fairy lights round the mirror, third is nonchalantly extending his arm over the side of the high chair and casually dropping whatever he is holding onto the floor. Other fun activities are wanting to play with whatever his sister is playing with, putting things in and taking things out of bowls/baskets and climbing into the dishwasher. He absolutely HATES having something taken off him and has a hissy fit every time. We had our health visitor arrive (unannounced) to do the one year check (6 weeks early!) a couple of weeks ago too so I now know he’s 10kg/23lbs and 91st percentile for height. I was told I was making a rod for my own back about a few things but I might save them for a ranty health visitor post. I have been completely slack in organising a birthday party for Arlo, and we’ll probably be moving around the time of his birthday anyway now so who knows what we’ll end up doing! Maybe I’ll do a belated birthday party for him joint with Athena in a few months. A linky for capturing and sharing any child related updates, be they weekly, monthly or more. Also welcome are any letters to your children, plus any other post celebrating a milestone that’s been achieved! It will be live on the 1st of the month till the 20th, so you can link up any relevant post and I’ve got a week at the end of the month to visit, comment and share your post on twitter/facebook. 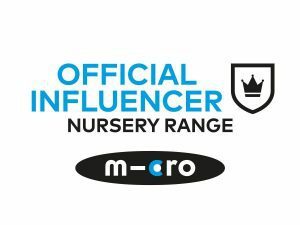 Posts recording your child’s milestones or achievements, monthly or weekly updates and any letters that you write to your children are all allowed! Please leave a comment on this post and it would be lovely if you could follow me on twitter & instagram if you have them! Please try and visit a few other posts from the link up, sharing is caring after all! I will visit and share every post linked up on social media! 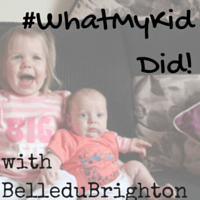 If you share using the hashtag #WhatMyKidDid @belledubrighton then I’ll RT those too! Look at him! How is he almost one already? I really hope the sleep thing improves for you soon – it must be exhausting! Oh he is so precious! Sorry to hear he has been ill though, nothing worse! Ignore the health visitor, I don’t see one but I don’t know of anyone who says they are any use at all! Thanks for hosting the linky! I’m glad he is better now, it is horrible when they’re ill! Aria is into all of the same things as her, especially dropping things which can be very frustrating when it comes to feeding time! We haven’t had Aria’s check up yet but I’m sure I’ll also be doing loads wrong according to my HV. I’ve loved following Arlo alongside T – especially watching how fudgey our babies have become. Reading about the visit from the HV (mine has still yet to visit – surprise surprise) I can only but imagine what their comments were! Although you don’t need me to tell you, IGNORE! Back to the important bit… I’m also glad to hear that Arlo has found an interest in food! I can’t imagine having a sick bug helped, but at least he’s getting there – it’ll make eating birthday cake easier (don’t talk to me about birthdays! ).